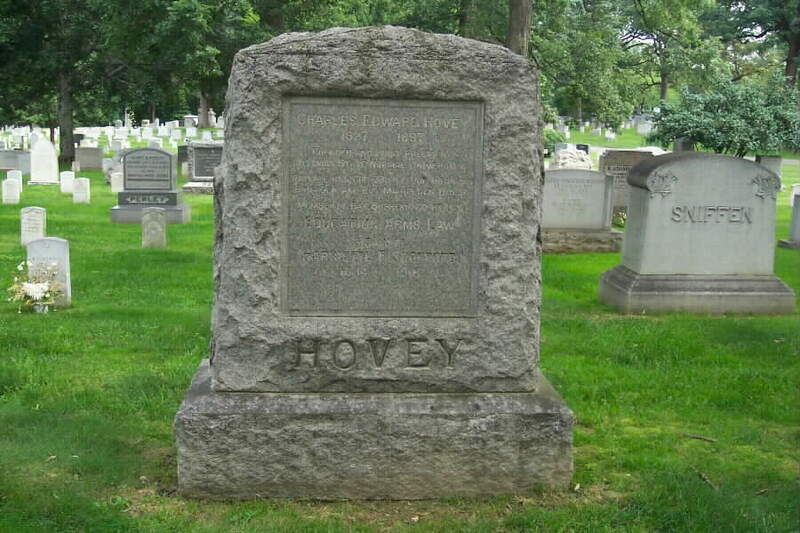 Charles Edward Hovey was born at Thetford, Vermont, April 26, 1827. He graduated from Dartmouth in 1852, having for years taught school during vacation periods to augment his own slender means in order to finance his education. From then until beginning of the Civil War, his career as an educator was enviable. Successively principal of Framingham (Massachusetts) High School, principal of Peoria, Illinois, Boys High School, Superintendent of Peoria schools, President of The State Teacher's Association, member of the first State Board of Education, founder of the original Sstate Teachers' University at Normal, Illinois. When the Civil War broke out in 1861, he organized the 33rd Illinois Infantry, a regiment largely comprised of teachers and students at Normal. He was commissioned Colonel August 15, 1861, and took the regiment to Missouri, where it saw service in a number of unimportant actions during the winter. For reasons undisclosed by historical records, he was appointed a Brigadier General of Volunteers to rank from September 5, 1862; the Senate, however, did not to act upon his nomination within the statuary period and it expired by operation of law March 4, 1863. In the interim he took a thoroughly commendable part in capture of Arkansas Post in January 1863, where William T. Sherman reported that he had been "wounded in his arm by a shell, but continued and still continues to command his Brigade." It is variously stated that he "was compelled to resign owing to a bullet which passed through both of his arms," and that "he left the service in May 1863." In any event disappeared from the Official Records, but as of March 13, 1865, in omnibus brevet promotions which accompanied the close of war, was prom Major General. In the years following the war he lived in Washington, D.C. Having once briefly studied law in Framingham, turned his undeniable talents as administrator and educator to far more profitable business of pension lobbying, which occupation was eminently successful. Died at Washington, D.C., November 17, 1897 and was buried with full military honors in Section 1 (Grave 33-D) of Arlington National Cemetery.